With such regal origins, it goes without saying that the high tea experience requires the utmost politeness, good manners and polished presentation. Get ready for all the Festival high tea events with our top tips for perfect high tea etiquette. 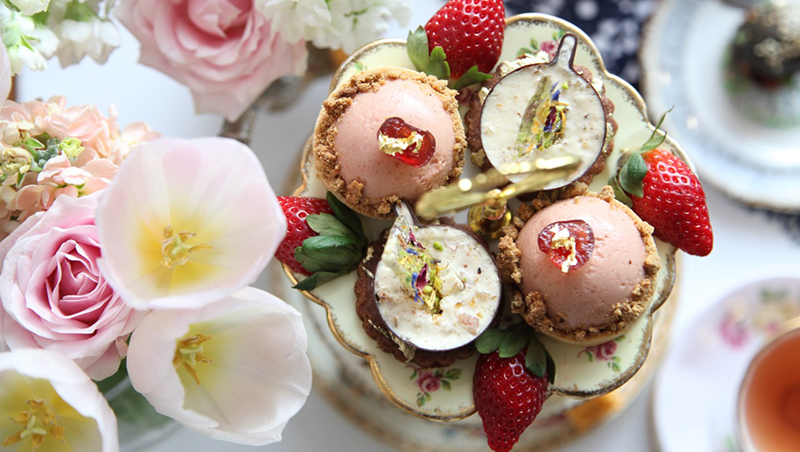 We caught up with the High Tea Society’s Michelle Milton to chat all things petit fours, pinkie fingers and the perfect brew. Here’s what she had to say about making your high tea simply lovely. The host should wait for guests to begin before starting. Making sure everyone at your table has what they need and is comfortable is just good manners. Guests won’t be shy to ask before you start, but after you’ve filled your teacup and plate, they may be reluctant. Use your fork if servers are not provided. Do not remove a plate from the tower – you want to be sure all the guest can reach the tiny delicacies on offer. When finished, fold the napkin and place to the side of your plate to signal to the host that you are finished. It’s a communal experience, designed to share and enjoy together. Make sure to chew your food with your mouth closed. You’ll have plenty of time for chatting between bites. Do not cut with a knife or fork. Use serving spoons to add jam and cream to your working plate – this will help to prevent raspberry jam on your high-tea best! For further preparation, visit the High Tea Society for history, etiquette and perfecting your cuppa. Use your newfound etiquette training at A Very ChocolaTea Time, The Langham Melbourne’s Lobster Laden High Tea and High Tea Paired with Wine and Tea.